The new school year is right around the corner. Star Dog's mission has always been for all kids to go to school feeling good about themselves, so they can focus on learning. That is why donating new Star Dog t-shirts to Father English last week was so special to us. Carlos Roldan, the director of The Father English Community Center gave us a tour of his impressive food and clothing bank. In the upcoming weeks parents will come in with their children to shop through the overabundance of donated items. The new and gently used clothing these kids receive from the center will help them feel confident for the first day of school. Ensuring that every child is ready to start learning the day school begins is the first step in a successful, productive school year, and Father English is essential in helping achieve that goal. Studies show when kids feel confident in their clothes, they perform better in school. Father English is a all access Community Center located in the heart of Paterson, NJ. In addition its food and clothing bank, the center provides the area's youth with counseling services, after school activities, homework assistance, life skill training and free workshops. For more information on the center and to donate or volunteer visit their website. 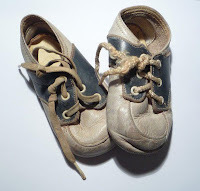 I was thrilled to be contacted by mommy blogger, Angela Theide of Worn Baby Shoes, who stumbled upon our Star Dog website and felt an immeadiate connection with us. Her blog is filled with warm heartfelt mom stories, product reviews, tips and ideas. Take a look at the kind words she wrote about us and then please show some love and follow. Just the name makes me smile! 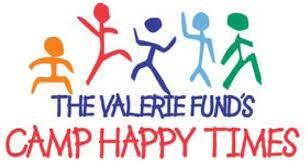 The Valerie Fund's Camp Happy Times. The Valerie Fund operates Camp Happy Times, a free one-week overnight camp experience for children aged 5-21 who have or have had cancer. Nearly 200 children each summer attend Camp Happy Times located at the two hundred acre Tyler Hill Camp in Wayne County, Pa. Tyler Hill is fully accredited by the American Camping Association and Camp Happy Times is a proud member of the International Children's Oncology Camping Association. For more than 25 years, Camp Happy Times has promoted friendship, independence, and a spirit of cooperation for cancer patients and survivors. The CHT philosophy is to provide a recreationally therapeutic environment that engages participants while building self-esteem, confidence, trust and friendship. The Valerie Fund pays for everything for these children while at this camp; food, shelter, activities - they even have a country store ( where our donated shirts will be placed ). The children get to go in the store for free and take whatever they want. 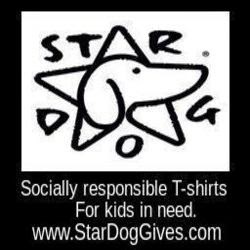 Sixteen lucky kids will get Star Dog T-shirts! at the end of August so you can still help. donate one to the camp. Remember, the more we sell the more we can give! 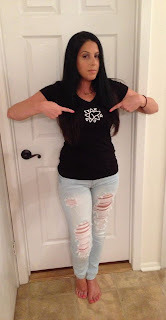 Our Friend Cara Zamorski writes about her fashion fling with Star Dog on her Fashion Swain blog. She looks marvelous!! Check it out.